Retired General Stanley McChrystal spoke with Mark O’Donald, right, at an event for Seth Moulton, center. PEABODY — In a steamy Elks lodge here Monday, he held the veteran-heavy audience rapt, talking about leadership and integrity. He had them in stitches, joking about the age-old tension between the Marine Corps and the Army. And retired Army General Stanley A. McChrystal, the onetime special operations guru who became the top general overseeing the war effort in Afghanistan, offered his backing to congressional candidate Seth Moulton, saying he had the kind of character that members of Congress need. 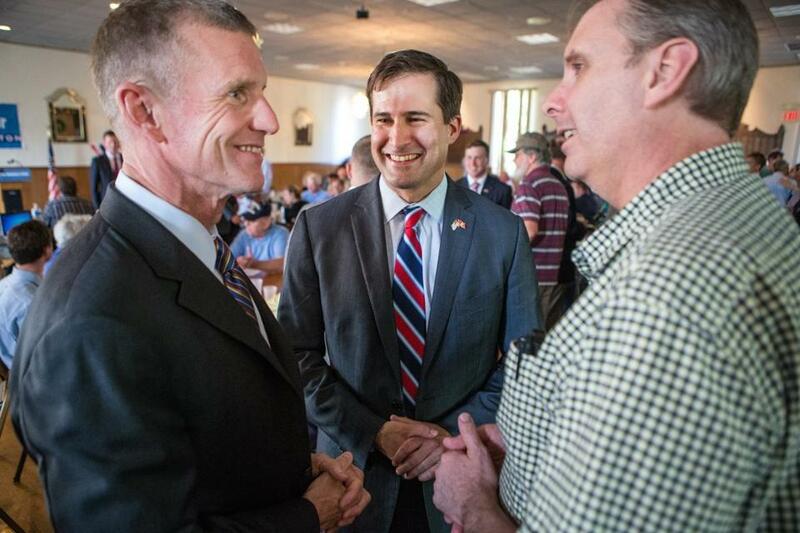 In an extremely unusual political event that brought a former top military man to a low-key intraparty contest, McChrystal endorsed Moulton, a Marine veteran who faces an uphill battle in his bid to unseat US Representative John F. Tierney in the Sept. 9 Democratic primary. The retired general, who was forced to resign in June 2010 after he and his aides were quoted speaking dismissively of civilian leaders in a Rolling Stone article, acknowledged that his presence in a political race was out of the ordinary. McChrystal said he was not a Democrat, Republican, or independent and had never before endorsed a political candidate. “But I thought it was time to change it and change it for one person,” he told just over 100 people seated at round tables. In a six-minute speech that touched on leadership, the economy, and the Arab Spring, McChrystal used a parable: A fresh-faced second lieutenant shows up in a platoon. That new officer has never been to war and doesn’t know how to soldier, but that’s something you can teach. What you judge them on, at that preliminary stage, is their character. And, he indicated, while Moulton would learn the ways of Washington if he became a congressman, he had the base of character necessary to be successful there. Still, McChrystal said with a smile, coming to this endorsement wasn’t all easy. “It is very uncommon for a soldier to be here endorsing a Marine. But I’m getting over that cultural hurdle — I’m in counseling,” McChrystal said, as the audience roared with laughter. Before introducing the general, Moulton gave the audience, which skewed older, a précis of his political philosophy, emphasizing moderate political stances and a focus on education and veterans. He alluded to his political novice status — a major difference between him and Tierney, who was first elected to the US House of Representatives in 1996. At no point, however, did he or McChrystal offer a direct critique of Tierney. Later, Miezwa said he was an independent voter, a Vietnam veteran, and was inclined to vote for Moulton. But he expressed more enthusiasm for McChrystal. “He’s a general who made a stand against Washington — and they fired him!” Miezwa said, in a tone that indicated he was offering high praise. A number of other veterans at the event said they were intrigued by Moulton and had deep respect for McChrystal, who now teaches at Yale University. “General, you’re one of my heroes,” Timothy Ready of Salem, who is in his late 60s, said to McChrystal before the event began. Ready subsequently told a reporter that he held McChrystal in high esteem. He had “stood very tall” under fire, both literal and political, Ready said, adding that he was inclined to vote for Moulton. While Moulton and McChrystal both served in support of the 2007 “surge” in Iraq, they did not meet during their time there. Instead, they said they connected after they had both left the military. Now McChrystal said they talk once every two weeks. Three other Democrats are also running in the Democratic primary in the North Shore-anchored Sixth Congressional District, hoping to win the party’s nod over Tierney. They are immigration lawyer Marisa A. DeFranco, John Patrick Devine of Woburn, and John J. Gutta of Groveland. On the Republican side, Richard R. Tisei, who narrowly lost a 2012 effort to unseat Tierney, is running again this year. As the event concluded, Moulton made a hard pitch for the audience to not only casually help educate their neighbors and friends about the race, but to also volunteer for the campaign in the weeks before the primary. And, in a nod to the audience’s very positive reaction to McChrystal’s remarks, he had one final request. “When Sept. 9 comes around, please do vote for me. Don’t write in General McChrystal, even though he was very impressive today,” Moulton said to laughter.